Our Ironing and Laundry services are only offered to clients that currently use Myhome for a regular cleaning service. The Myhome team will simply do any ironing on site during the same time as the clean takes place. Where the client requires a laundry service then the team will simply take all the laundry back to our office. It will then be laundered and dropped back to the client on the next scheduled clean or earlier if needs be. All our cleaning operatives are fully vetted and DBS checked. They are also fully trained and certified carpet cleaning professionals. It is always our intention to ensure that the security of our client’s homes are always in the best possible hands. We have the ability to launder everything from linen sets to regular duvets and also super king size and feathered duvets. Please see below price list for details. All on site ironing is done by hand, folded and can be put into your wardrobes once completed. We can provide a professional shirt laundry service, whereby your shirts are taken away and returned on re-useable hangers. Having your linen and shirts professional laundered can extend their life by removing all the trapped fibres and debris which will damage your fabrics if left unchecked. It also removes any fungi and pollen which will help the fight against dust allergies and asthma keeping you healthier and happier. Comprehensively removes unpleasant odours such as Cooking, Pets and Cigarette smoke and gives you clothes that fresh new smell. As one would expect prices for both ironing and laundry services depended on the amount left out or the weight collected and returned. Some specialist items are priced individually so please feel free to discuss this with the customer service team. Getting your shirts wrinkle free can be difficult and without the right knowhow almost impossible. Take a look at some of the below tricks used by the professionals which will have your shirts looking perfectly pressing. 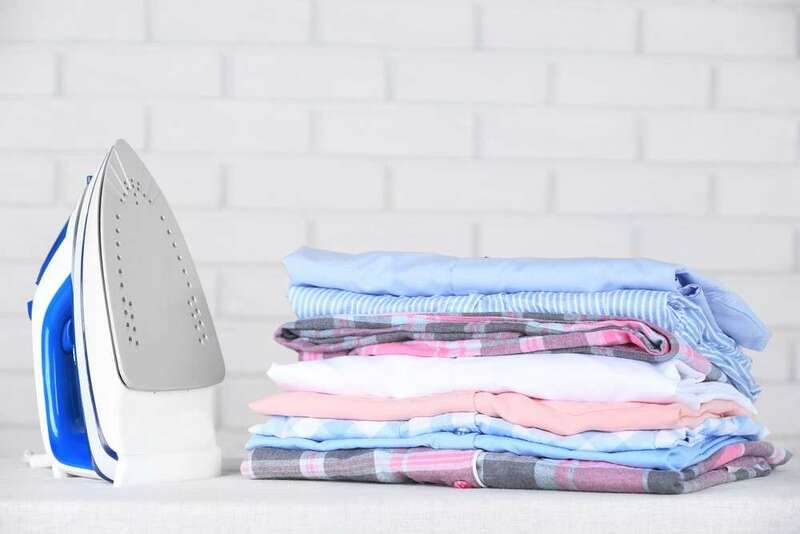 First step is to sort all your clothes and shirt to be ironed according to the recommend temperature, start with the coolest and progress to the hottest. Typically silks and other delicate synthetics would be ironed on a low heat, wool items on a medium-high, and finally cotton or linens are ironed at high heat (approximately 400°F). This way you will save time by having to wait for the iron temperature to adjust after each change. Once you have ironed an item immediately hang up or fold. Do not leave it sitting around as it will only re-crease. do so lengthwise from top to bottom or side to side. Never use rounded movements as to do so would stretch the fabrics. Any wrinkles encountered can be dealt with using the steam trigger. such as a duvet covers or bed sheets can be difficult as most of the item will reach to the floor and so can wrinkle again. By using some kitchen chairs next to the ironing-board you can drape the parts of the fabric which you have ironed over the chairs and thus avoiding this problem. can still easily be singed or shiny when ironing. Use a pressing cloth such as a handkerchief to protect these items. Simply keep the handkerchief between the fabric and the iron at all times. point of view always try to keep the electric or steam cord safely out of harm’s way to avoid tripping over it. Also, if you need to use an extension cord, use a 12-amp cord as this will be very unlikely to overheat and cause a fire. to a pair of trousers start from the bottom and work from the inside of the pleat to the outside. Once you are happy with the position of the pleat set them with a burst of steam. always allow clothes “rest” for a couple of hours to give the creases time to set.